Peter Mellor wakes up on the side of the road, the wheels of his overturned car still spinning. He feels a bit numb, a bit dazed, and can’t seem to remember who he is or how he ended up in this state. Eventually, he discovers that the world is in the grip of the “zombie apocalypse” all the kids have been raving about…and that he apparently didn’t survive that car wreck after all. He’s a zombie (albeit an intelligent and self-aware one) and sets out to find his girlfriend and put his life (such as it was) back together. He also discovers that in the midst an undead uprising the most dangerous creatures (other than himself) are the people for whom the veneer of civilization that served as a leash and who now roam the countryside, are indulging in their heretofore hidden amoral desires. Kenemore (Z. E. O. and The Zen of Zombie) infuses his debut novel with the perfect mix of horror, gore, humor, and (yes, it must be said) brains that make it a tight and entertaining read. Peter, even during the darkest period of his strange existence, is an extremely sympathetic character—especially as we learn more and more about the type of man he was before he was transformed into a brain-addicted denizen of the undead. While portions of the book are extremely dark, and there is plenty of blood and viscera for the gore-hound, it is Peter’s flip sense of humor that infuses the novel with life. It is Kenemore’s insightful peek at human nature at the extremes that infuse it with intelligence. While billed as “a tale of murder, mystery, and the walking dead”, the novel actually deals very little with the subplot of Peter’s apparent murder. Peter does discover that his fatal crash was not an accident, but he really only spends a small part of the story worrying about that. 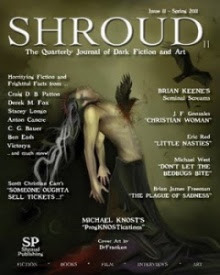 The truth comes to light the facts serve the story well, but to term the novel even part murder mystery is a stretch. 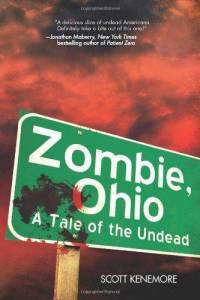 Despite the mystery misnomer, Zombie, Ohio is a great bit of zombie-infused fun for both devotees of the genre and for folks desperately seeking an antidote to sparkly vampires and angst lycanthropes.